Three line break charts are popular with traders. The charts indicate the start of a trend reversal fairly accurately. Being not time-based three line break charts are difficult to observe and interpret. The NanoTrader solves this by converting them into clearly visual bands. The three line break bands are a trading signal in NanoTrader. 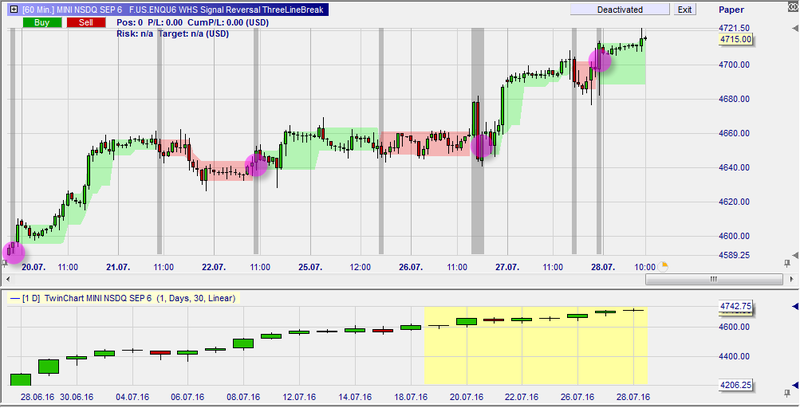 If a trend reversal occurs the trader gets a signal and, if desired, an order is generated automatically.